MANILA, Philippines - The official results, list of passers, top examinees and other important announcements for March 2018 Civil Service Exam - Pen and Paper Test (CSE-PPT) both for professional and subprofessional levels are released by the Civil Service Commission (CSC) within sixty (60) days after the eligibility examinations. 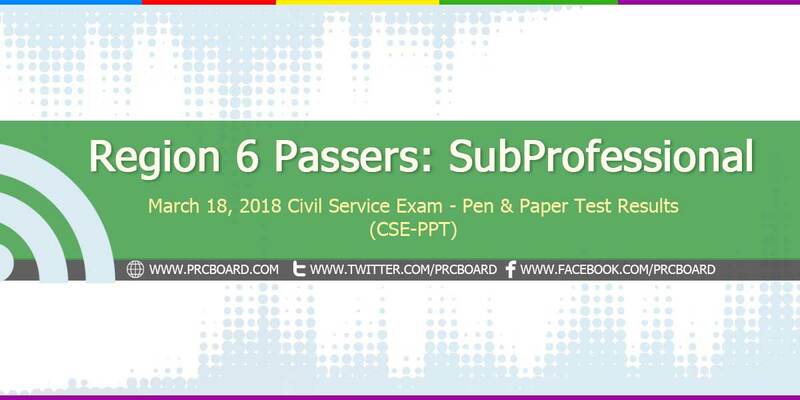 Below is the complete list of passers for March 2018 CSE-PPT Subprofessional Level in Region 6 (Western Visayas). Dear God hope and pray that you will grant my prayer to pass the CSE-PPT, to God be all the Glory.. AMEN! lord God, i hope my mother passes, grant her wish. to God be all the glory. AMEN!! I trust in you Lord GOD! In Jesus name I will pass the CS exam. I claim it!